Source: U.S. Energy Information Administration, based on SNL Energy. A combination of natural gas prices at 10-year lows and the warmest winter on record led to lower on-peak wholesale electricity prices so far in 2012. On-peak prices fell between 24% and 39% across major wholesale price hubs from January to June of 2012 compared to the same period of 2011 (see map above). Off-peak (nights and weekends) electricity prices were also down for first-half 2012 compared to first-half 2011, although generally less than the declines in on-peak prices over that period (see map below). 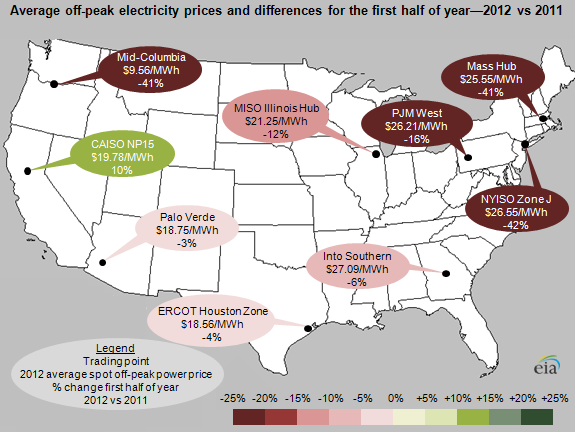 In contrast to other major power trading locations, off-peak prices in Northern California at CAISO NP15 increased 10% when compared to first-half 2011, mainly because of more nuclear outages this spring and record-breaking hydroelectric output during the spring of 2011. Off-peak prices generally reflect the cost of maintaining output from baseload generators, while on-peak prices reflect the price of generating from intermediate and peak generators throughout a given day. Spot natural gas prices during the first half of 2012 generally fell about 40-50% compared to the same period in 2011 and on some days neared their lowest levels in a decade. Lower natural gas prices led to increasing use of natural gas to generate electricity, contributing to lower wholesale electricity prices, especially for on-peak prices. 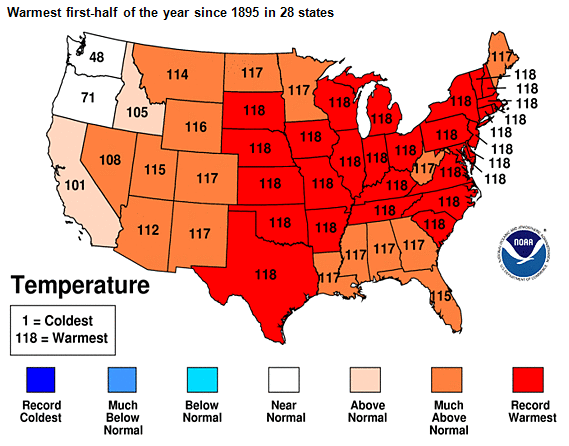 In 2012, twenty-eight states, mainly in the middle and eastern portions of the United States, reported their highest average daily temperatures for first half of any year during the past 118 years according to information reported by the National Oceanic and Atmospheric Administration (see map below). Warm weather at the start of 2012 contributed to reduced demand for both electricity and natural gas to heat homes, and contributed to lower wholesale natural gas and electricity prices. Source: National Oceanic and Atmospheric Administration National Climatic Data Center. Note: A rank of 118 means temperatures in that state during January-June 2012 were the warmest in 118 years (or the highest on record). A rank of 117 indicates the second-warmest temperatures in that state, etc.